I remember eating those rice-crackers a (very) long time ago when I was at college in England. At the time I never made the relation between these snacks and Japan! Senbei (煎餅, alternatively spelled sembei) are a type of Japanese rice crackers. They come in various shapes, sizes, and flavors, usually savory but sometimes sweet. Senbei are often eaten with green tea as a casual snack and offered to visiting house guests as a courtesy refreshment. 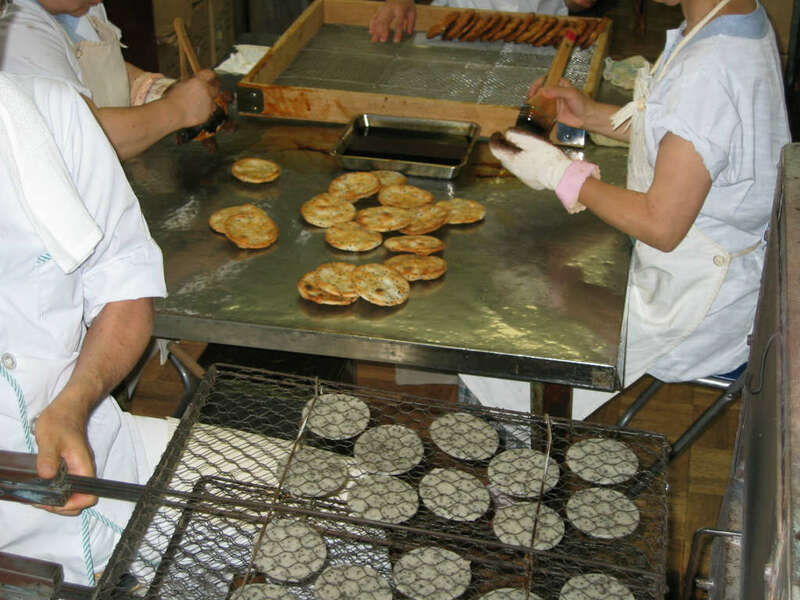 Senbei are usually cooked by being baked or grilled, traditionally over charcoal. While being prepared they may be brushed with a flavoring sauce, often one made of soy sauce and mirin. They may then be wrapped with a layer of nori. Alternatively they may be flavored with salt or so-called “salad” flavoring. In China, the same characters used to write senbei are read jiānbǐng (煎餅). There are varieties like Shandong Jianbing and Tianjin Jianbing. However, these are in actuality a different food. In China, they are more like wraps and pancakes, similar to okonomiyaki, whereas in Japan they are hard (not floppy), and are bite-sized snacks rather than meals. However, crackers similar to Japanese senbei can be found in China today. Their modern Chinese name is 仙贝 (or 鲜贝) (Pinyin: xianbei), which reflects the Japanese-language pronunciation of “senbei” (煎餅). 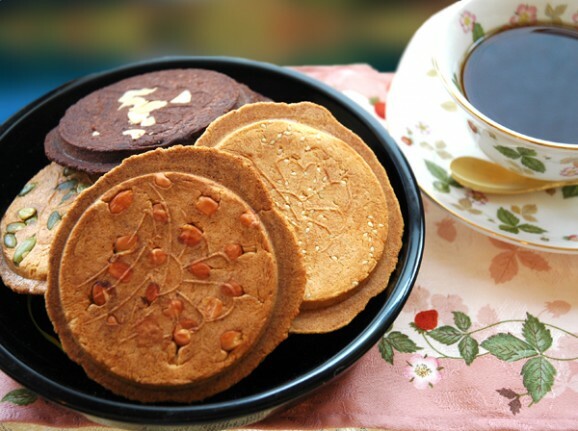 Sweet senbei (甘味煎餅) came to Japan during the Tang Dynasty, the first recorded usage in 737 AD, and still are very similar to Tang traditional styles, originally often baked in the Kansai area, of which include the traditional “roof tile” senbei. These include ingredients like potato and wheat flour or glutinous rice, and are similar to castella cakes. (Distinctly different from what most people would consider as Senbei today). What Japanese commonly refer to as sembei nowadays was popularized by a shop in the Edo Period, Sōkajuku, which spread salty soy sauce flavored sembei throughout Japan. 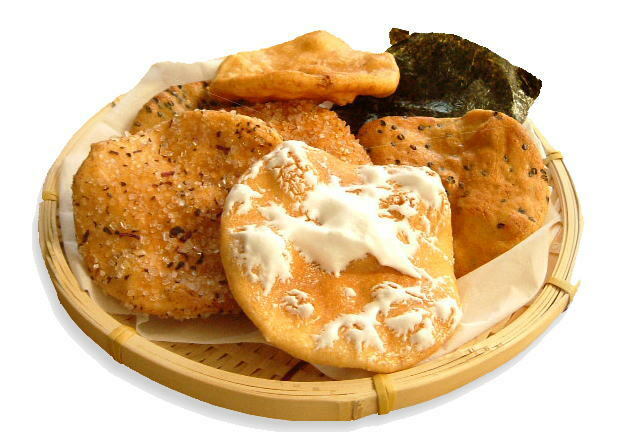 There are several types of traditional Japanese senbei. They include the 2 categories, sweet sembei (over 15 types) and rice candy senbei (米菓煎餅), and others, which include even fish senbei (魚せんべい), lotus senbei (蓮根煎餅) and bone senbei (骨せんべい). Modern senbei versions are very inventive and may include flavorings which can range from kimchi to wasabi to curry to chocolate. Kansai senbei tend to use glutinous rice and have a lightly seasoned and delicate in texture (saku saku). Kantō senbei were originally based on uruchimai, a non-glutinous rice, and they tend to be more crunchy (kari kari) and richly flavored. Arare (あられ “hailstones”) is a type of bite-sized Japanese cracker made from glutinous rice and flavored with soy sauce. The size and shapes are what distinguish arare from senbei. There are many different sizes, colors, and shapes of arare. Some are sweet, and others savory. 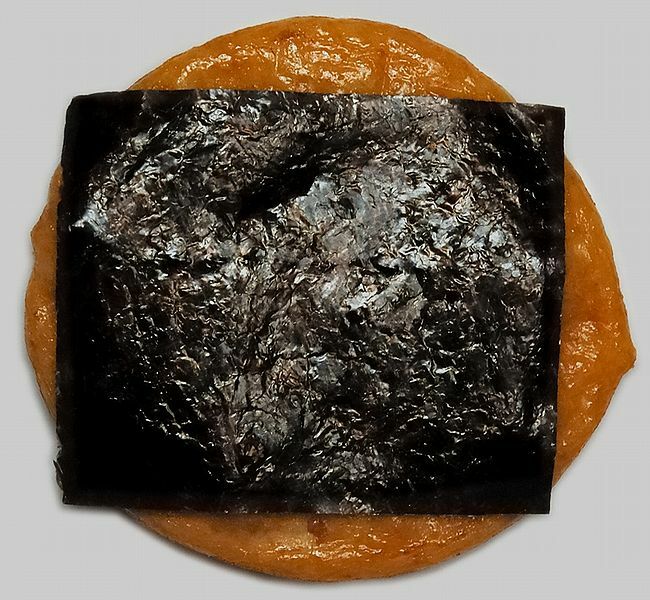 One, called norimaki arare (nori meaning an edible seaweed foodstuff in the form of a dried sheet; maki meaning roll shape) is wrapped with dried nori seaweed. Another, kaki no tane (柿の種), takes its name from its resemblance to a persimmon seed. (Kaki is Japanese for “persimmon”.) 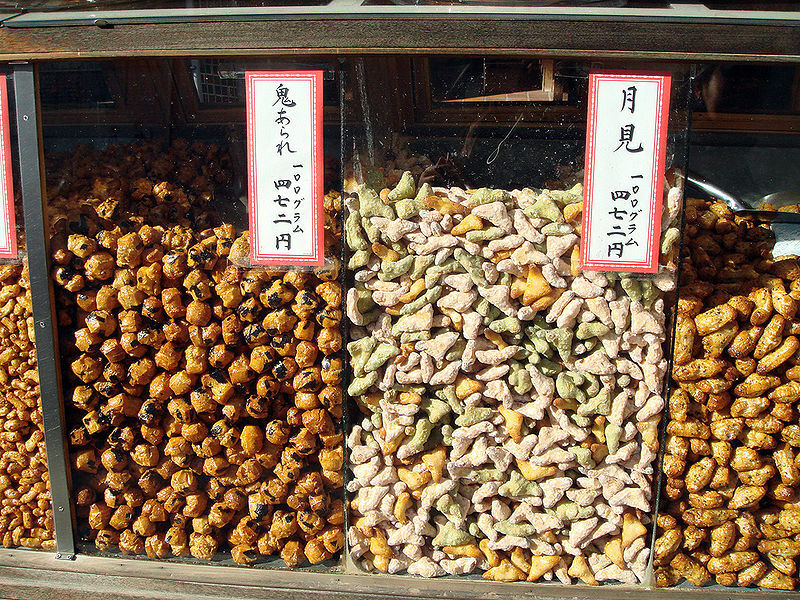 Kaki no tane are often sold with peanuts, a combination called kakipī (かきピー). These are a popular snack to accompany Japanese beer. Japanese typically consume arare to celebrate the Doll Festival (Hinamatsuri), on March 3, Girls’ Day in Japan. The arare made during the festival are very colorful – pink, yellow, white, brown, light green, and so on. Regular arare can be bought throughout the year, but the colorful ones are only available around January to March in anticipation of the Doll Festival. Arare was brought to the U.S. by Japanese immigrants who came as plantation workers in the early 1900s. 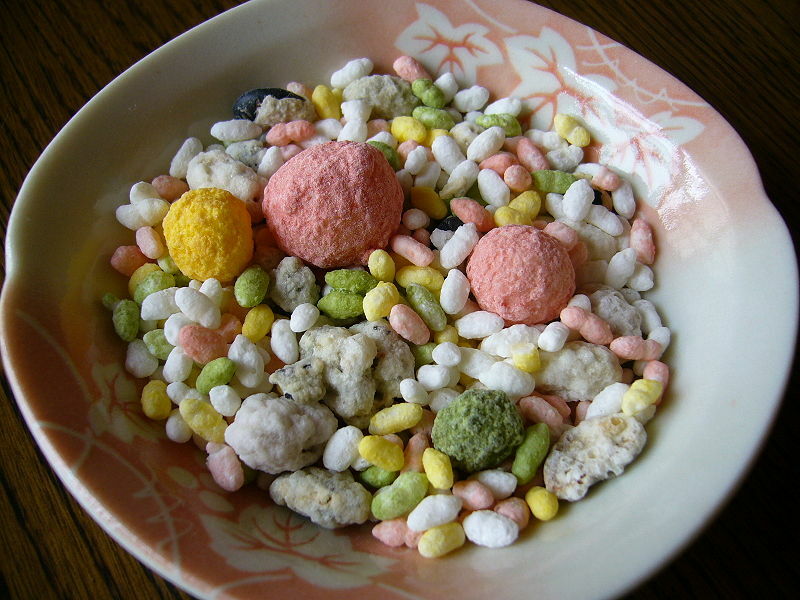 In Hawaii, the snack is often called kakimochi (fried rice paste) or mochi crunch. In Hawaii, it’s popular to mix arare with popcorn (some people mix in furikake, too). The popular Hurricane popcorn includes both arare and furikake with the popcorn. Also popular in Hawaii is li hing arare. Agemochi (揚げ餅?) is a popular Japanese snack food made from fried mochi (sticky rice). 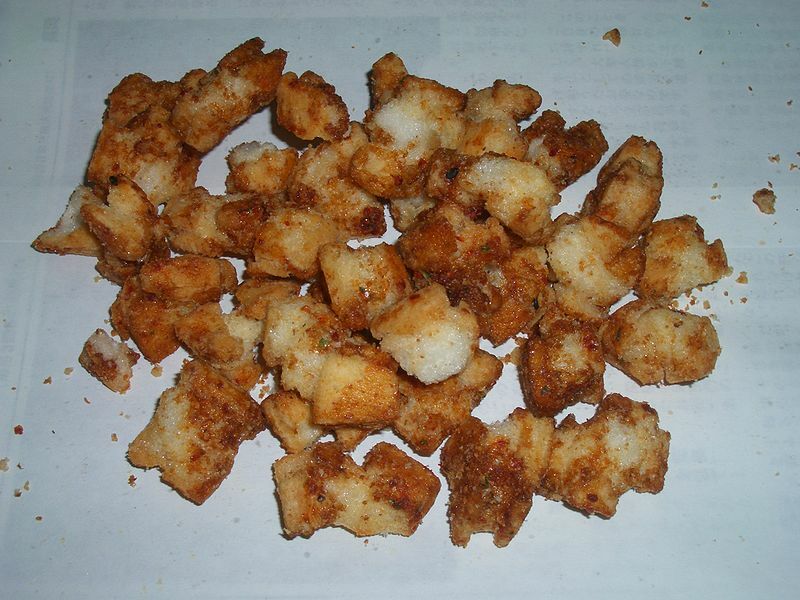 The dry mochi is broken into small pieces, about 1cm cubed, and deep fried. The pieces then puff up. It is usually eaten lightly salted, but there are also various flavoured versions, such as shichimi agemochi, agemochi covered with shichimi seasoning. Agemochi can be purchased anywhere in Japan and is also a common home-made snack. Yatsuhashi (八ツ橋 or 八橋) is a Japanese confectionery sold mainly as a souvenir sweet (miyagegashi). It is one of the best known meibutsu (famous regional products) of Kyoto. It is made from rice flour (上新粉, jōshinko), sugar and cinnamon. Baked, it is similar to senbei. 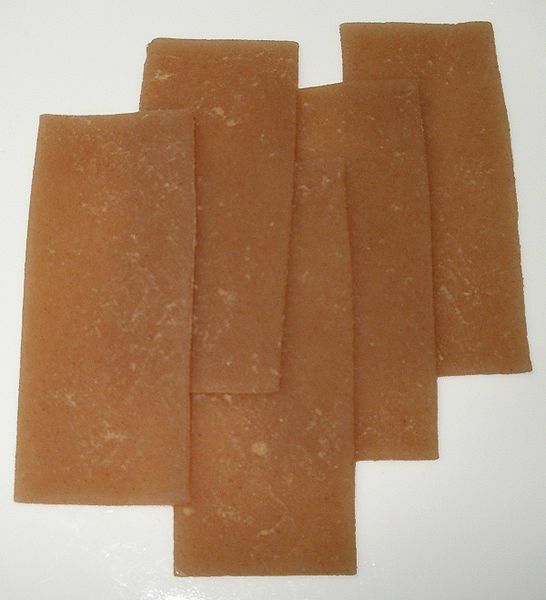 Raw, unbaked yatsuhashi (Nama yatsuhashi) has a soft, mochi-like texture and is often eaten wrapped around red bean paste (餡, an), and may come in a variety of different flavours. Most notable to the Kyoto area is the black version of this. The addition of black bean powder to the wrapper gives a distinctive black color. 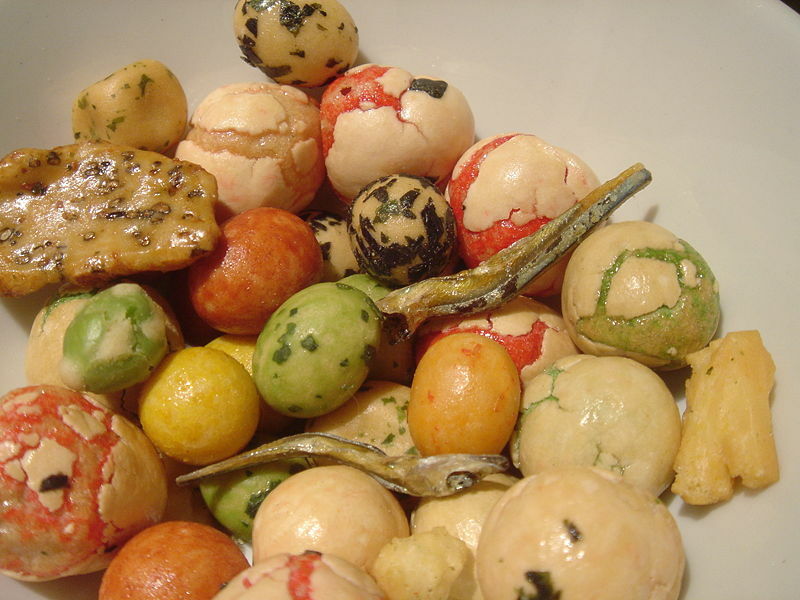 Kappa Ebisen (かっぱえびせん) is a Japanese snack food produced by Calbee of Japan. 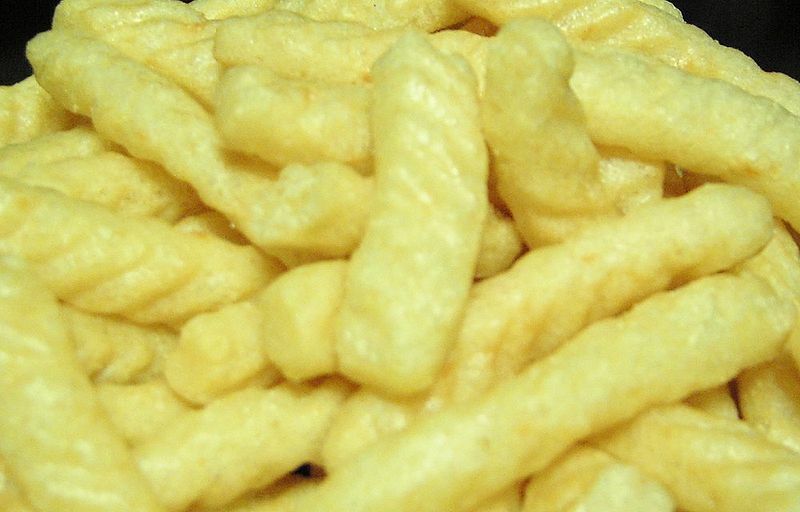 It is a crunchy, shrimp-flavored snack resembling french fries that is very popular in Japan. The primary ingredients of Kappa Ebisen are wheat flour, vegetable oil, starch, shrimp, sugar, salt, baking powder, amino acid and sweetening. Kappa Ebisen was first sold in 1964 and has gained wide popularity among Japanese consumers as a snack food. In 1966, Calbee began exporting Kappa Ebisen to Hawaii and Southeast Asia. It is now sold in dozens of countries worldwide. There are different flavors of Kappa Ebisen, such as curry flavor, available in Japan and a few other countries. A similar product known as Saewoo Ggang (새우깡) has been produced by Nongshim of South Korea since 1971. It is not licensed by Calbee. Well, this is for the basics! Will look for varieties and recipes from now on! i am interested in learning how to make senbei, where can I get the recipe information that i might try? Thanks for the update! Always appreciated!